East Northfield, Massachusetts: a Junction; a Tunnel Motor; A Searchlight and Three Quarter Light. Years ago, the view from the road bridge at East Northfield, Massachusetts was more open than it is today. The trees have grown up making it more challenging to expose photos of trains at the junction between former Boston & Maine and former Central Vermont lines here. At one time, a century or more ago, B&M’s Conn River route crossed the CV here. B&M’s line continued across the Connecticut River and rejoined the CV at Brattleboro. Later, the two routes were melded in a paired track arrangement. However, by the time I started photographing here in the 1980s, the B&M route north of East Northfield was no longer functioning as a through line. On the morning of April 27, 2018, I made this view of New England Central freight 608 led by a former Southern Pacific SD40T-2 ‘tunnel motor’ diesel. New England Central 611 approaches the junction at East Northfield, Massachusetts. The lead locomotives have just crossed the Vermont-Massachusetts state line. The old Boston & Maine line once continued to the right of the present NECR alignment (and to the left of the dirt road), running northward across the Connecticut River and beyond via Dole Junction, New Hampshire toward Brattleboro. The light was spot on for a series of three quarter views featuring a vintage GRS searchlight signal that protects the junction. Perfect morning light makes for a calendar view from the road bridge at the junction. NECR 611 continues south toward Palmer, Massachusetts on the old Central Vermont Railway, the old Boston & Maine route diverges to the left toward Greenfield and Springfield, Massachusetts. Portrait of New England Central 3476. Last week I made this digital portrait of New England Central 3476 using my FujiFilm XT1 with f2.0 90mm lens. Soft cross lighting combined with a wide aperture made for pleasing photographic conditions to picture this engine against a backdrop of Vermont colorful autumn trees and distant New Hampshire hills. The locomotive was working New England Central’s Brattleboro (Vermont) to Palmer (Massachusetts) turn freight, job 611, and was among many images I exposed that day. This old EMD-built locomotive has a long history, having worked for Southern Pacific and Union Pacific before coming east to New England. I wonder if I crossed paths with it up on Donner Pass, in the Tehachapis, or on former Rio Grande lines in Colorado and Utah? From my Kodachrome Archives: Genesee & Wyoming 51 at P&L Junction. In March 1987, I exposed this Kodachrome 25 color slide of Genesee & Wyoming GP38 number 51 leading an empty salt train arriving at P&L Junction (P&L infers Pittsburgh & Lehigh) near Caledonia, New York. At that time Genesee & Wyoming was a New York state short line that had just recently expanded with the creation of the Rochester & Southern to operate the former Baltimore & Ohio (nee Buffalo, Rochester & Pittsburg) 4th Subdivision between Rochester and East Salamanca, New York via Ashford Junction. (R&S had trackage rights on CSX from Ashford Jct. to East Salamanca). This train was arriving from interchange with the Delaware & Hudson at Silver Springs. (D&H had trackage rights over the former Erie Railroad line to Buffalo.) It would reverse direction at P&L Junction and head southward on G&W’s own line (seen in the immediate foreground) to Retsof, where G&W served a massive salt mine. Back then G&W 51 had no special significance, but it does for me today. Professional Kodachrome 25 (PKM) exposed using a Canon A1 with 50mm lens and processed by Kodak in Rochester, New York. Clean Orange Locomotive—an Easy Catch. In early February, I was running a few last minute errands before my Trans-Atlantic journey. Crossing the Boston & Albany on South Main Street in Palmer, Massachusetts, I saw a New England Central local approaching with an impressive cut of interchange. In the lead was clean New England Central GP38-2 2048 in Genesee & Wyoming corporate paint. Although I’ve made countless hundreds of photographs from this location over the years, I won’t look a gift-horse in the mouth. So for the sake of a couple of minutes detour, I made these images at CP83 using my Lumix LX7. New England Central 2048 at Palmer, Massachusetts in February 2017. Filtered winter sun makes for nice light to photograph locomotives. The train was moving slowly, which allowed me time to make several images as it passed. This angle features GP38-2 2048 from a closer, more broadside angle, while retaining a good view of the old gas building, which is a prominent Palmer-area icon. Lumix LX7 photo. Alcos at Brooks Avenue, Rochester, New York. Rochester & Southern’s yard at Brooks Avenue was just a ten minute drive from the Rochester Institute of Technology. When I was in college, I had an open arrangement with the railroad to make photographs, and during the late 1980s I often dropped by to exercise my cameras. 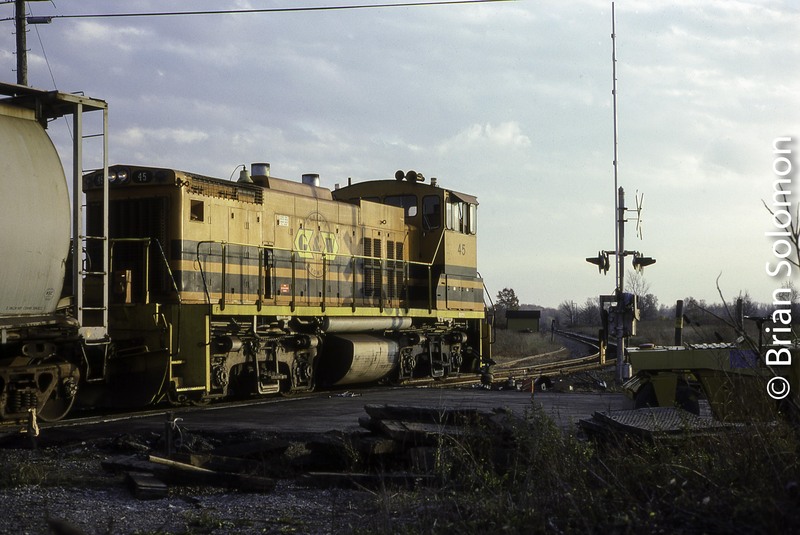 In April 1989, I made these photographs of Genesee & Wyoming Alco C-424M 62 on the Brooks Avenue scale track. The Alco Century’s well-balanced cab design made these among my favorite classic diesels. I’d photographed the C-424Ms on Delaware & Hudson, Genesee & Wyoming, Guilford, and finally on Livonia, Avon & Lakeville’s Bath & Hammondsport line. Here I’ve worked the yard office into my composition that makes for nice juxtaposition of shapes. Black & White film handles the backlit situation well and retained detail in shadows and highlights. Compare my telephoto and wide angle views. Free Film, a Borrowed Camera and a Bit of Luck! In November 1986, Kodak supplied me with a free roll of TMax 100 black & white film as part of a ‘care package’ of new products for students in the Photographic Illustration programs at the Rochester Institute of Technology . The combination of Kodak’s recently released T-Max 100 ‘T’ grain black & white film and a Canon 50mm lens allowed for a very sharp image with exceptionally fine grain and broad tonality. I scanned this 35mm negative with my Epson V500 scanner. Incidentally, at the left of the image is General Railway Signal’s Rochester plant. The T-Max black & white films were brand new at the time. They were significant because they used a new ‘T’ grain that featured flat silver halide grains that were supposed to reduce the visual granularity in the film (and lower the film’s silver content). On this bright sunny morning, I went trackside in Rochester to expose my free film. I had Kodachrome 25 in my Leica M2, so I borrowed my roommate’s Canon A1 for the film test. Leading R&S’s local was Alco RS-3m 211 leased from the recently formed Genesee Valley Transportation. The locomotive has a long and colorful history. It featured both a large steam generator and dynamic brakes (thus the high short-hood) and was one of only five RS-3s were built this way: four served Western Maryland, while this one went to the Pennsylvania Railroad but later was traded to the Lehigh Valley, becoming its 211. After 1976, Conrail replaced 211’s original Alco-244 diesel with a recycled 12-cylinder EMD 567 engine. Since I made this image, the locomotive has been preserved and restored at the Rochester & Genesee Valley Railroad Museum in Rush, New York. This cropped detail gives a hint of the exceptionally fine grain afforded by T-Max 100 film. A Pair of Pumpkins on the Move. New England Central job 610 crosses the CSX diamond at Palmer, Massachusetts on October 28, 2013. Canon EOS 7D 200mm lens. Genesee & Wyoming acquired Rail America some months back and so now New England Central is one of the many G&W family railroads. While several locomotives have been painted in the new corporate colors (or rather, G&W’s traditional paint scheme), many of New England Central’s locomotives remain in various former liveries, including the railroad’s original blue and yellow. On Monday October 28, 2013, New England Central job 610 (a turn that runs from Willimantic, Connecticut to Palmer, Massachusetts) sported a pair of nicely painted G&W locomotives. My dad and I made chase of this train on its southward run. I exposed digital still photographs, while Pop made some video clips with his Lumix LX7. The sun was playing tag with us, but the locomotives were so bright and clean it hardly mattered if the sun was out or not. The view from Smith’s Bridge on Stafford Hollow Road in Monson, Massachusetts where Bob Buck exposed dramatic photos of Central Vermont steam more than 60 years ago. New England Central job 610 climbs the grade toward State Line. Canon EOS 7D fitted with 20mm lens. 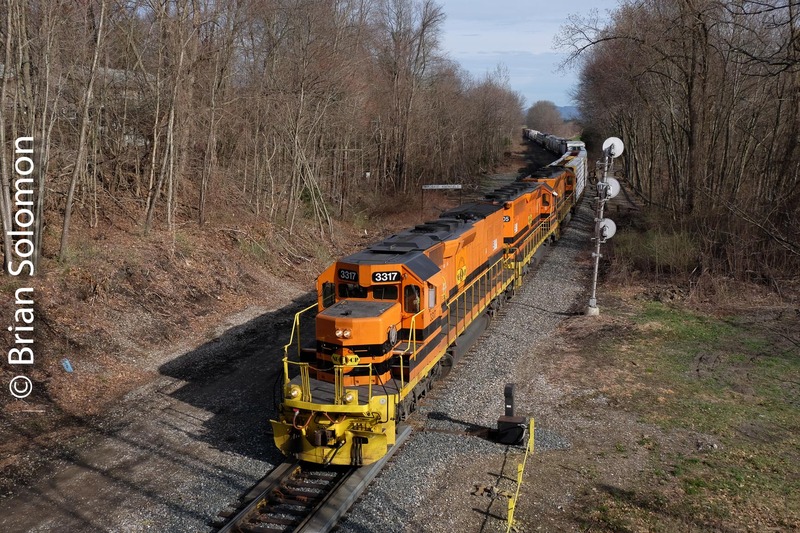 Richard J. Solomon (at left) exposes a short video clip as New England Central job 610 passes Stafford Springs, Connecticut. Canon EOS 7D fitted with 20mm lens. New England Central job 610 works south of Stafford, Connecticut on October 28, 2013. Canon EOS 7D fitted with 20mm lens. Also check out previous posts: Genesee & Wyoming at P&L Junction, November 4, 1987; Two Freights 24 Hours Apart, Seeking the Elusive Orange Engine(s); New England Central at Stafford Springs, Connecticut on May 21, 2013, and New England Central at Millers Falls, Massachusetts, December 9, 2012. Classic Locomotives at Scenic Spot. In recent months, New England Central’s operations have been altered. This has benefits for photography. Since the times trains tend to run have changed, different locations have opened up for photographic possibilities. For many years, New England Central operated a southward freight from Palmer, Massachusetts in the early morning (typically as job 608), this worked into Connecticut (to Willimantic and beyond) and returned in the afternoon or early evening. Now, on many days, the railroad runs a turn from Willimantic to Palmer (often as job 610), that goes on duty at Willimantic in the morning, runs northward to Palmer, and returns. From my experience the return times vary considerably. Once I was aware of this change, I began thinking about various places to make photographs based on afternoon lighting angles. Last week, I heard 610 working south from Palmer. I was in luck as a pair of vintage GP38s in the railroad’s original scheme (the locomotives were painted by Conrail in preparation for New England Central’s February 1995 start up). Track speeds south of Palmer make following a train easy enough. My first location was Stafford Springs, where I’ve often exposed photographs of New England Central. From there I followed southward. New England Central GP38s lead freight 608 southward at Eagleville, Connecticut on October 21, 2013. Exposed with a Canon EOS 7D with 40mm pancake lens. My final location of the day was at the Connecticut Eagleville Preserve, where the line passes an old Mill dam (I’m not well versed on the specific history of this dam, but the arrangement is common enough in New England, where in the 19th century water powered local industries. For more information on the park and area see: http://www.willimanticriver.org/recreation/pg_park_eagleville-preserve.html). Afternoon sun favors this location, and I made the most of the light, waterfall and autumn foliage as well as the GP38s. Trains Converge on Palmer; 2 Hours of Non-stop Action. At 2:02 pm, New England Central GP38 3855 works CSX’s Palmer yard. Canon EOS 7D photo. In the 1980s, Trains Magazine occasionally ran articles that featured ‘hot spots’ illustrated by sequences of photos showing different trains passing the same place over the course of hours. These always caught my attention. While the individual images ranged from pedestrian to interpretive, the collective effect produced an understanding of how a busy spot worked. Trains tend to arrive in clusters. Hours may pass where nothing goes by except a track car, then trains arrive from every direction. The astute photographer has learned when to make the most of these situations. Palmer, Massachusetts can be a busy place, if you’re there at the right time. CSX’s east-west former Boston & Albany mainline crosses New England Central’s (NECR) former Central Vermont line at grade. An interchange track connects the two routes and serves as connection to the former B&A Ware River Branch operated by Massachusetts Central. Afternoon tends to be busy. Among the moves through Palmer are Amtrak’s Vermonters that use CSX’s line between Springfield and Palmer, and NECR’s line north of Palmer toward Vermont. 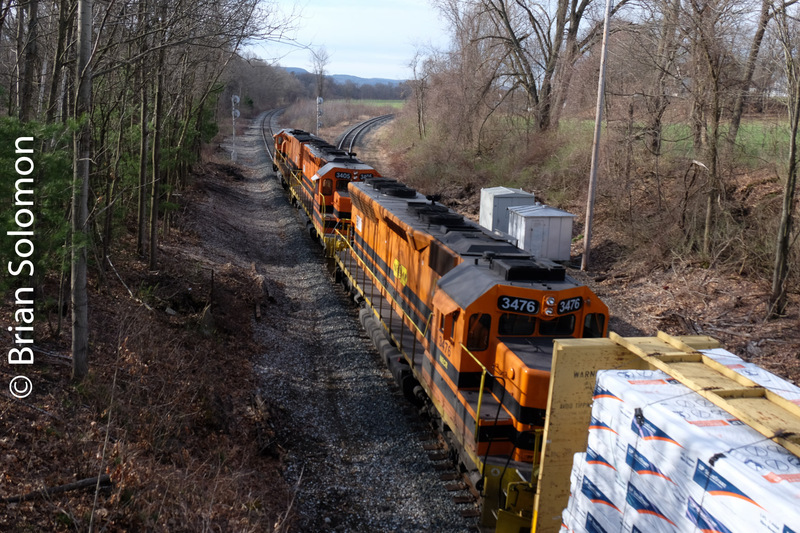 There isn’t a direct connection to allow an eastward train on the CSX route to directly access the NECR’s line. To compensate for this, Amtrak’s trains must use CSX’s controlled siding to access the interchange track, and this to reach the NECR. This requires trains to reverse direction. As a result, Amtrak trains either have locomotives on each end or run with a push-pull cab control car. On the afternoon of October 17, 2013, the interchange track proved one of the busiest lines in Palmer and was used by a succession of NECR, Mass-Central, and Amtrak trains. Complicating matters was Amtrak 57 (southward Vermonter) which was running more than an hour behind its scheduled time, and so met its northward counterpart at Palmer. New England Central was also busy with no less than three trains working around Palmer about the same time. I’ve put the following photos in sequence with the approximate times of exposure. I stress ‘approximate’, since my digital camera’s clocks not only didn’t agree on the minutes passed the hour, but were set for different time zones as a function of recent travel. It was a nice bright day too. Patrons at Palmer’s ever popular Steaming Tender restaurant (located in the restored former Palmer Union Station) were entertained with a succession of trains passing on both sides of the building. A southbound New England Central local approaches the Palmer diamond at 2:33 pm. Canon EOS 7D photo. At 2:49 pm Mass Central’s freight from South Barre looks to work the interchange track to reach the CSX yard. Canon EOS 7D photo. New England Central 3809 has gone across the diamond to collect southbound train 611 and is now returning with the train and looking to re-cross CSX . Canon EOS 7D photo. Having dropped its interchange and collected its cars from CSX’s yard, Mass-Central 960 returns west on the interchange track at 3:23 pm. A New England Central local with engine 3855 can be seen in the distance working the yard. Canon EOS 7D photo. Photographer Paul Goewey focuses on Mass-Central as the train passes over the interchange. Lumix LX3 photo. At 3:37pm Amtrak 56, the northward Vermonter crosses the Palmer diamond and enters the controlled siding at CSX’s CP83. Its locomotive, P42 153 is shoving at the back. The Steaming Tender is in the old station building on the left. Canon EOS 7D photo. With Amtrak 56 tucked in on the controlled siding, New England Central’s local passes on the interchange track at 3:40 pm. Lumix LX3 photo. Amtrak 56 has pulled forward onto the interchange and then reversed back again to make room for its southward counterpart to access the switch that connects the interchange track with CSX’s controlled siding. Lumix LX3 photo. Amtrak’s southward (left) and northward (right) Vemonters are nose to nose at Palmer. Lumix LX3 photo. At 408pm, both Vermonters depart Palmer. 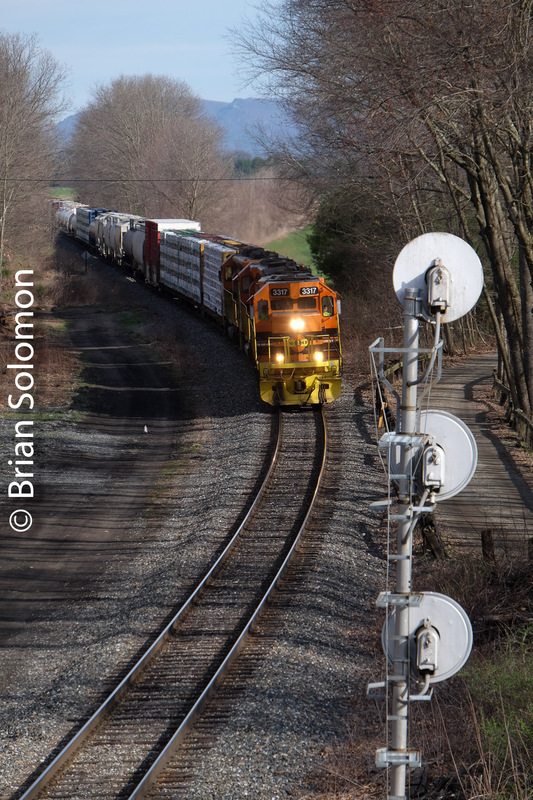 The train on the left, leading with P42 number 153, is heading north to St Albans, Vermont, while on the right the southward train will exit CSX’s controlled siding and head west toward Springfield before continuing south to New York, Philadelphia and Washington DC. Lumix LX3 photo. Not bad for one afternoon! Yet, not a CSX train in sight. These days much of CSX’s business passes Palmer in darkness. See my Dublin Page for images of Dublin’s Open House Event in October 2013. On the morning of November 4, 1987, I made a speculative foray to P&L (Pittsburgh & Lehigh) Junction near Caledonia, New York. At the time I was living in nearby Scottsville, and I’d occasionally check P&L to see if anything was moving. Genesee & Wyoming SW1500 47 crosses the Peanut Line at P&L Junction. Thin autumnal high clouds softened the morning sun. The photo was exposed with a Leica M2 with 50mm Summicron on Kodachrome 25 slide film. P&L Junction had once been a very busy place. Here the original Genesee & Wyoming had connected with Lehigh Valley, Buffalo, Rochester & Pittsburgh, a branch of the Erie, and New York Central’s so-called ‘Peanut Line.’By 1987, the only railroads left were G&W and its Rochester & Southern affiliate. I was fortunate to find a southward train and I made this image of a southward G&W salt train heading across the diamond with a vestige of the old Peanut Line (that G&W used to reach a couple of miles into Caledonia). A classic ‘tilt board’ crossing signal protected the diamond. Today, it seems that G&W railroads are everywhere. I even saw a G&W company freight in Belgium a couple of weeks ago. Back then, I couldn’t have imagined that this New York state short line would reach so far! Orange Engine at Stafford Springs, Ct., and Irish Rail’s IWT Liner in Dublin. New England Central 3015 in fresh Genesee & Wyoming corporate colors passes the Stafford Historical Society in Stafford Springs, Connecticut. Canon EOS 7D with 28-135mm lens. Irish Rail’s IWT liner passes Islandbridge Junction in Dublin. Last week I made these photos, nearly exactly 24 hours apart (one in the morning, the other in the afternoon). The first image shows New England Central’s freshly painted GP402-L 3015 leading a southward freight at Stafford Springs, Connecticut. I was delighted to finally get this elusive orange engine operating on a road-freight in daylight. The next image was made in Dublin, after a trans Atlantic crossing courtesy of Aer Lingus. This shows locomotive 073 struggling along with the second IWT Liner at Islandbridge Junction near Heuston Station in Dublin, Ireland. Later, I heard through the grapevine that 073 failed a few miles down the line and require assistance. Both images were made with my Canon EOS 7D. Also both feature 1970s-era General Motors diesels singly hauling freight under bright sunny skies. New England Central at Stafford Springs, Connecticut on May 21, 2013. Tuesday, May 21, 2013 was a clear bright morning. I heard New England Central’s 608 climbing State Line Hill through Monson. I dithered briefly about heading out to photograph it. I’ve only photographed New England Central’s trains about a thousand times (metaphorically). When I went to make myself a cup of tea I discovered to my horror that there wasn’t any milk! Poor show. So, I made the most of both problems. I drove to Stafford Springs, where I waited all of five minutes to score a few nice bright shots of a pair of New England Central GP38s. (I made a couple of slides too—just for ‘the record). Then stopped in at the shop in Stafford Hollow for milk before heading home again. New England Central freight 608 crawls through Stafford Springs, Connecticut on May 21, 2013. Canon EOS 7D with 28-135mm lens. Canon EOS 7D with 28-135mm lens; exposed at f8 1/500 ISO 200. What I find interesting is that, 16 years ago I made similar images of the same GP38s in the same location! A lot has changed in that time. Back then New England Central was part of RailTex. Now, after a dozen years as a RailAmerica road, it’s a Genesee & Wyoming property. Somehow, I doubt that in another 16 years I’ll still be able to make images just like these. But you never know. It’s nice having an interesting railway nearby.